Omega-3's are fabulous for your skin and hair. Consuming the best ratio of Omega 3's to Omega 6's is also important for your overall health. One way to accomplish this is to eat fish. But wait. It's not that simple. It never is. There are a couple details to keep in mind when buying and eating fish. Overfishing is a serious problem, so sustainability is key. Additionally, some fish contain high levels of mercury. Mercury is a neurotoxin, so minimizing exposure is crucial. However, I have never found a list that combines these two pieces of information. So recently I consulted a few sources and cross listed them to determine which fish are lowest in mercury, but still sustainable. I'm just going to print out this little list and tuck it in my wallet for the next time I visit the grocery store. Oh, and while you're at it, want the recipe for that delicious dish up top? 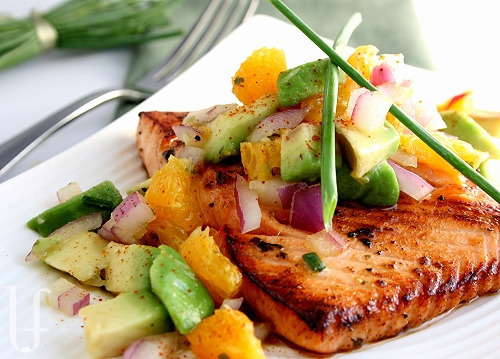 It's Citrus Glazed Salmon with Avocado Salmon. Yum. Keep in mind that this compilation is specifically for the West Coast of the United States. If you are living elsewhere in the world, take a look at the sources below, where you can find similar information for your locale.